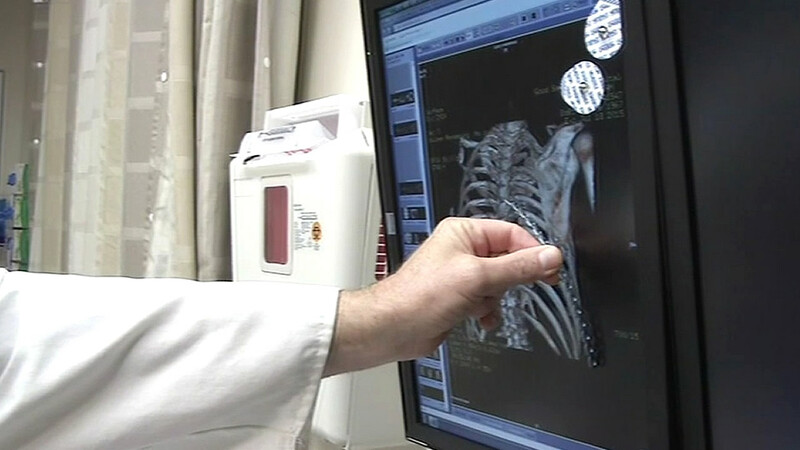 SAN JOSE, Calif. (KGO) -- A new procedure is offering relief from a common and incredibly painful injury - cracked ribs. After gliding 30 miles on his bike, Dave Kehmeier's ride came to an abrupt and painful end just a block from his home. "I hit a curb and went over and it didn't feel too good," he said. He was rushed to Regional Medical Center of San Jose with injuries that included multiple broken ribs. That's when Jeff Kaplan, M.D., suggested a new treatment approach known as rib plating. "They go on the outside of the rib, so what you do is you make an incision and expose the rib fracture," he said. Kaplan says standard procedure in the past has been to let the ribs heal by themselves. But he says the breaks can cause excruciating pain, requiring pain killers so powerful they often interrupt a patient's ability to breathe normally, putting them at risk for pneumonia. "Being so sedated that you don't breathe well at all," he said. The narrow plates are sized to individual ribs and attached with screws during surgery. Kaplan says once the ribs are fixed into place, the level of discomfort drops dramatically. "Basically, if you can immobilize the rib with a plate, the pain goes away," he said. Since the procedure is still relatively new, insurance coverage can be on a case by case basis, but he believes any additional cost is offset by faster recovery times. "People are generally out of the hospital in two to three days," he said. As for Kehmeier, he says his ribs have recovered to the point that he's ready to hit the road again. "I joke with my wife I'd like to ride across the U.S. sometime," he said. The plates are generally recommended in cases where two or more ribs are broken and where the bones don't line up well because of the breaks.